Annotation: A chance meeting between gifted mechanic Cinder and Prince Kai starts a chain reaction revealing Cinder’s past and secrets as plague and a looming moon kingdom threaten Earth’s peace. Plot Summary: The first of a four book series, Cinder is a spin on the Cinderella story set in a futuristic sci-fi Earth. Orphaned as a child in a hoverboard accident and saved only by installing machinery inside her, Cinder is shunned by society and family alike for her cyborg parts. Living in New Beijing with her stepmother and stepsisters, Cinder dreams of making it on her own, but she is legally bound to her stepmother. Her gifted mechanic skills brings a chance meeting with Prince Kai, but he does not know her dirty little secret – that she is part cyborg. Meanwhile, in the shadows plague and a ruthless lunar kingdom loom ominously threatening Earth’s fate. Critical Evaluation: Cinder retains some of the classic fairy tale elements: a girl under the thumb of her domineering stepmother, a prince charming, two stepsisters, and a missing shoe. However, it is in the details and world building that Meyer remakes Cinderella into a fresh tale and a wholly new one. In this fairytale, Cinder is a cyborg. As not fully human Cinder faces discrimination from not only her family, but from society at large. People avoid her simply for who she is and legally her freedom is tied to her stepmother. As the focal point of the story, Cinder’s characterization shines through. A smart, capable heroine – Cinder’s is not one to depend on others towards determining her fate. Rather, she makes her own path. Even early on, she relies on her skills as a mechanic to save enough money to break free of her stepmother’s hold. While she lacks ability to show emotion, Cinder is capable of feeling strongly whether it is love or sorrow. 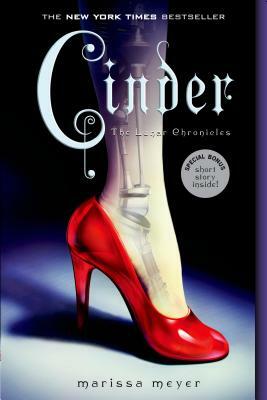 In addition to the exploration of prejudice and class, Meyer uses the Cinderella plotting of prince meets girl to a new direction where Cinder unravels secrets about her past. However predictable that revelation is, Meyer sets up a suspenseful science-fiction fueled story that leaves readers scrambling for the next installation. A clever take on a classic. Challenge Issues: To defend this book, I would utilize this starred review from Publisher’s Weekly as well as this interview with Marissa Meyer from VOYA.